Elena Volkova was born in 1915 in the Ukrainian city of Chuguyev (birthplace of Ilya Repin) from a modest family, her father was a swimming coach, her mother, a peasant. In 1934 she began to work as assistant-projectionist for a mobile cinema. During the war she was affected in an hospital; her husband died during the war. Without any artistic training, she began to paint at the beginning of the 60s at the age of 45. Elena Volkova lived in Moscow. In 1947, Elena Andreevna a son, Valentin, who began to study painting. 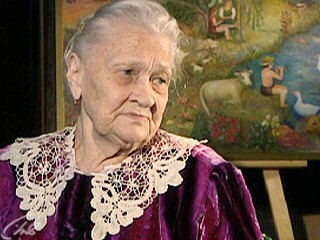 It was then that she took his son paint, Volkova turned herself to the painting (in 1961). Her first work was still life on cardboard, then appeared narrative compositions. All-Union Exhibition of amateur artists (ENEA, “Montreal” Pavilion), Moscow, 1987. 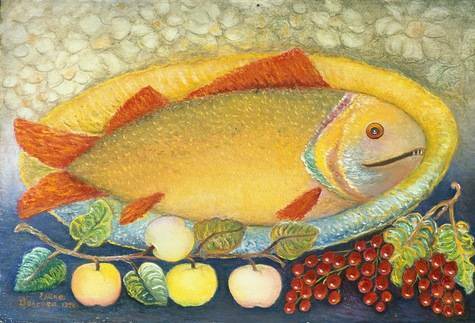 INSITA-94; “Russian delicacy.” Still Life in the works of naive artists. Curator K. Bogemskaia. Moscow. Gallery “DAR”, 1995. The “Moscow-Berlin”. Exhibition of paintings by naive artists of Germany and Russia in the halls of the Russian Museum of Decorative, Applied and Folk Art (on the delegate Str. ), Moscow, 1996. Wisdom with naive eyes, Kirov, 1997. Russische Naieven … (The Netherlands), 2000. And I saw … 2001. The image of the world in the naive art. Vienna-Oslo 2002- 2003. Bogemskaya K., Turchin A., Die Naive Kunst Russlands // Erste Begegnung mit der Russische Naive, / Katalog / Museum Charlotte Zander (Deutschland), 1999. Bogemskaia K. Naive Art. Elena Volkova. Saint-Petersburg. “Dmitry Bulanin”, 2001. E. Volkova, Peace to all. / Catalogue of the exhibition in the Tretyakov Gallery / Articles D. Sarabyanova V. Patsyukova, K. Bohemia, V. Volkov, N. Kuchinke, E. Volkova), Moscow, 2005.